The topic on every internationally minded Chinese person’s lips when in conversation with a Westerner appears to be the US-China trade war. The following text summarises my informal discussions over lunch and during walks, with friends and colleagues in Shanghai, on the reasons behind, and potential consequences of, growing economic tensions between the world’s two largest economies. My interlocutors are researchers and postgraduate students at some of Shanghai’s elite universities, as well as start-up entrepreneurs and employees of major Chinese tech firms. Our discussions highlight a troubling thesis: many worry that this trade war may be a precursor to a greater conflict, driven by US reluctance to cede its hegemonic position to a rising China. Ultimately, the discussions illustrate that the trade war embodies two irreconcilable visions of global economic order. The roots of the trade war lie in accusations by the US and other countries of economic malpractice by the Chinese government, in particular the violation of intellectual property rights and the privileging of Chinese State Owned Enterprises (SOEs) in the domestic market. First, intellectual property theft has allegedly occurred in two ways: through the requirement that foreign companies share their technology when accessing Chinese markets, and through the use of spyware and hackers, both by the Chinese government and by businesses, such as Huawei (though no evidence for this has yet emerged). Second, the Chinese approach to economic management, consisting of state subsidies for state owned enterprises (SOEs) and preferential treatment for SOEs vis-à-vis foreign companies, is seen to violate WTO regulations stipulating a level playing field for international trade. In short, the US is demanding profound structural changes in the way that Beijing manages the Chinese economy – that it ditches, or at least softens, its commitment to a managed economy. Thus, the Trump administration launched an investigation immediately upon taking office in January 2017, having long been critical of Chinese financial practices. Since March 2018, the Trump administration has applied over $250 billion worth of trade tariffs onto Chinese goods imported into the USA, arguing that the tariffs will make Chinese goods less competitive and encourage consumers to choose products made in America, thereby reducing the US’ large trade deficit with China. Predictably, Beijing responded by applying $110 billion of trade tariffs onto US goods. At the time of writing, the trade war has been paused to allow negotiators to try to reach a deal before the 2nd March deadline when a further $200 billion of US tariffs on Chinese goods are due to come into force. Progress, unfortunately, is slow. The perceived poster child for these practices is arguably ‘Made in China 2025’, China’s strategic plan to move away from its position as the global ‘shop floor’ for cheap manufactured goods, and catch up with high-tech Western companies in the fields of robotics, transport, aerospace, pharmaceuticals, and energy and agricultural equipment. Launched in 2015, the aim is to increase the market share of domestic high tech suppliers to 70% in ten years and ensuring that a specific number of component parts in various products should be produced domestically. Critics argue that in order to achieve these lofty goals, MiC2025 will involve a smorgasbord of economic malpractices, including both intellectual property theft and preferential treatment for Chinese companies. In the wake of this criticism, MiC2025 has mysteriously disappeared from the media limelight in recent months; it is however unlikely that the project has been abandoned. Obscured in the British media by the omnipresent and all-consuming Brexit coverage, the trade war is an issue with far reaching consequences, not only slowing growth in China, but also in other Asian economies, such as Japan and South Korea, which depend on exports of specialised parts to China that are then used to make technical equipment and mobile phones. Furthermore, the trade war is also impacting the US economy, and the IMF and World Trade Organization have both issued concerns that it could trigger a global recession. ’, coined by US political scientist Graham Allison to describe the near inevitability of war when a rising power seeks to displace the hegemonic power, is well known. More than one Chinese linked the discussion to a consideration of why Xi Jinping last year extended his presidency indefinitely. Was it because the defining task of his presidency is to ensure China becomes the new global hegemon and, in order to do this, a war is necessary? Friends pointed to the defining acts of other important Chinese leaders – Mao Zedong’s establishment of the People’s Republic of China, Deng Xiaoping’s reform and opening up of the country – and suggested that Xi believes his historic task is to finally place the Middle Kingdom at the centre of the global order. This is not a prospect that my interlocutors relish; comfortable members of the nascent middle class, they do not want military conflict to threaten new-found stability. Other, less sensationalist perspectives acknowledge that China has been violating WTO regulations for some time, and that its transparency record is indeed poor. However, they also observe that China is far from alone in failing to adhere to WTO best practice and fall back on the fear of China’s rise thesis to explain why the US is targeting them over other states. Some point to the personal characteristics of Donald Trump, a businessman with a ‘zero-sum’ mentality, who is thought unable to see trade from the ‘win-win’ perspective of the Chinese. 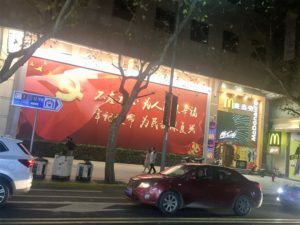 A third, much smaller group suggest that the impact of the trade war has been overblown by the Chinese government to mask other failings in the Chinese economy, such as the impossibly high tax rates for small and medium sized businesses, the ageing population, and slowing consumption patterns. The trade war, in some senses, can be seen as a battle of capitalisms. China’s rise has demonstrated that countries able to control their economies, especially via protectionist measures in particular sectors, are able to achieve remarkable economic performance. Indeed, the ‘China model’ of state capitalism has lifted over 500 million people out of poverty since 1981, reducing the percentage of those living on less than two dollars a day from 88% to 6.5%; meanwhile the poverty rate in the US has remained more or less constant between 11.5 and 15%. This fact rankles the current defenders of global free market capitalism; yet, ironically, in demanding that China opens its economy, the US imposed trade tariffs actually damage the openness of global trade on which this order is founded. While the astonishing growth of China’s middle class is now inevitably levelling off, China’s rise nevertheless poses an existential challenge to the universal applicability of Western-oriented capitalist model. Posted in Uncategorized. Tagged capitalism, China, economy, liberalism, trade war, USA, world order.